HealthSure and Barry Couch Celebrate 20 Years! Life is about to get very interesting for community hospitals with self-funded employee health plans. Long regarded as an effective cost control strategy, self-funding is an increasingly popular choice for those willing to accept a calculated amount of risk. Usually, hospitals make the move because their frustration with not knowing what’s driving up premiums outweighs their reluctance to take on more risk. 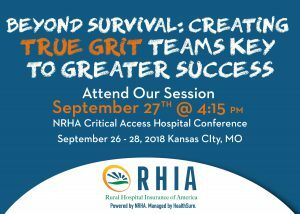 Now, with the creation of a new innovative coalition, rural hospital leaders who self-fund their employee healthcare programs can take a giant leap forward toward greater cost control, better health outcomes for employees, and the potential of a significant cash return on their investment in risk. Developed by HealthSure, the Community Hospital Insurance Coalition (CHIC) is the first medical stop loss insurance program in America designed exclusively for community and rural hospitals. “CHIC is an innovative combination of proven strategies managed by people who have a track record of doing whatever it takes to protect and empower rural and community hospitals,” says Larry Bedell Executive Director, NRHA Services Corporation. Let’s face it, providing healthcare to rural communities has never been easy. The people who lead our community and rural hospitals continue to succeed in an environment many would consider un-survivable. They respond to a seemingly endless gauntlet of challenges with courage, creativity and, recently, an increasing amount of collaboration with each other. 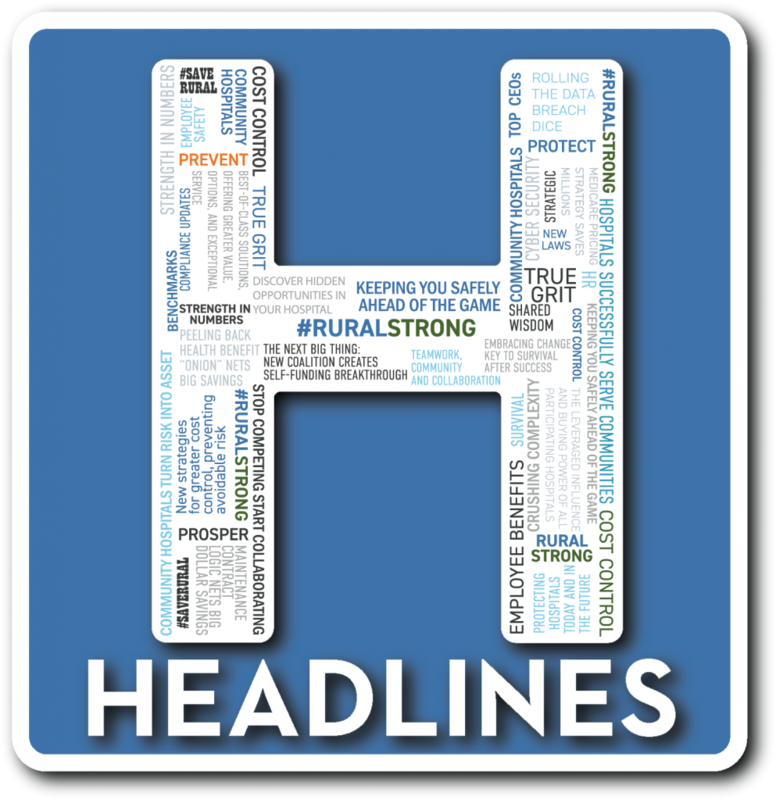 More and more, like-minded healthcare leaders are working together to ensure rural healthcare remains strong. To them, #ruralstrong is not just a trending-now-gone-tomorrow cause; it is an ongoing mission and they recognize collaboration is one of their most powerful assets. Fear turns people into victims of change while courage makes possible the acceptance of risk in the face of the unknown. Collaborating with like-minded leaders means not having to face risk alone. Beyond an increased ability to take advantage of change, working together creates new opportunities no single leader could create, or take advantage of, on his or her own. At its most basic, buying insurance is paying someone to take away risk. It makes sense to buy insurance if you view risk as a liability to be minimized, if not totally eliminated. But, what if you could manage risk in a way that turned it into a powerful and valuable asset? If risk is an asset, then buying insurance can mean you’re paying the insurance companies to take away an asset! Insurance companies already know how to use your risk as an asset. To turn risk into an asset, it must be managed. To manage the risk in your employee healthcare plan, you need full access to your plan data. In a self-funded plan, you have access to all your data. That gives you the power to implement cost control strategies such as early intervention, customized coverage, and targeted wellness programs. The concept of pooling risk and negotiating together has significant advantages beyond better prices. By sharing strategies about what works and does not work, coalition members significantly improve their ability to increase the return on their investment in risk. They are able to move beyond the complex and stressful process of “renting” insurance one year at a time and become risk “owners”. “Aggregating risk is well tested and proven in the market. CHIC is just one more innovative strategy for making self-funding easier, safer, and, over the long term, will enable hospitals to leverage risk and take greater control of the future,” says John Henderson, CEO of the Texas Organization of Rural and Community Hospitals (TORCH). Reflecting on his previous role as CEO of Childress Regional Medical Center in Texas, Mr. Henderson says collaborating with other TORCH members along with a willingness to continuously explore and implement new ideas has been key to Childress’ success. A review of Berkley’s performance show that on average, members paid 8% less in self-funded retention claims than expected. It also shows annual cost increases for members from 2012 – 2016 were 2% below projected medical trend. The cost of reinsurance for self-funded plans is trending up (on average 11%). 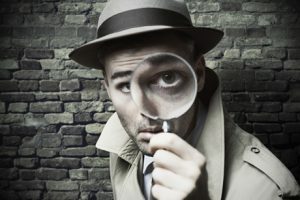 When an employer has a good year with fewer and smaller claims, they do not have any opportunity to recoup any of the premiums they’ve paid for stop loss coverage. CHIC changes all of that. We calculated the potential for 17 hospital clients over the past two years and determined just over $2 million in premiums would have been returned. This was when we knew we had to launch CHIC. While the opportunity for returned premium is real and significant we recognize this won’t be sustainable if hospitals aren’t doing everything in their power to control their own claim costs. We believe each hospital is only as good as the advice you get or the leverage you have. Alone, rural hospitals often don’t get the best advice and you have very little if any leverage. CHIC gives you both. Finally, planning ahead is the key to survival. This is a fundamental principle that has not been previously applied to health insurance. With CHIC, planning ahead means a group of hospitals not only reduce reinsurance costs, but share data, identify trends, group purchase from other vendors, and implement new ways to take more risk and gain more rewards. To find out if the Community Hospital Insurance Coalition (CHIC) is right for you, to explore self-funding opportunities, or to discuss any of the concepts shared in this article, please contact Brant Couch. Thursday, July 12th HealthSurians gathered to celebrate our 20 Year Anniversary. It was a great time to reflect on the company’s growth for the past two decades. It also was the perfect opportunity to surprise our founder, Barry Couch. For weeks the buzz around the office was “shhhh…..don’t spoil the surprise.” We succeeded, both Barry and his wife, Judy, were surprised! Our team looks forward to many more years of helping healthcare organizations prosper in the increasingly complex world of healthcare risk and insurance. Cheers to 20 Years…and many more to come! HealthSure is looking for the real deal: a successful, experienced sales professional who wants more, much more. Have you seen someone who wants more opportunity, more support, more compensation and a much more promising future? Do you know of someone who has a proven track record fostering relationships with executives and owners into revenue growth? Someone who is an instinctive problem solver with strong listening skills, experienced in managing long sales cycles, and the persistence to grow a new client base from scratch? If you do, we must have a conversation. The right person, the real deal, will become an essential member of our team of A players. They will be rewarded with professional training & support, a competitive comp package, becoming an expert in the healthcare industry, and long term potential for agency profit sharing. HealthSure offers extremely flexible work arrangements, a strong culture of empowerment, teamwork, and support to advance your career. In a world where critical access hospitals have to do more with less, how do you lead your hospital to go beyond mere survival? Join a hand-pick panel of Top 20 Hospital CEOs to learn their specific strategies for nurturing highly engaged teams, controlling cost, and creating new revenue. Brant is President of HealthSure and leads business development, programs and strategic account management. HealthSure is the program manager for RHIA. For nearly 15 years Brant has worked closely with community hospitals to develop new and better ways to ensure their success. Rebecca McCain is the CEO of Electra Memorial Hospital in Electra, TX. She has served the hospital for 28 years as CFO, COO and CEO. She earned her Bachelor’s Degree in Accounting from West Texas A & M, and her Master’s in Health Care Administration from Trinity University. Robbie Dewberry is the CEO of Mitchell County Hospital in Colorado City, TX. He has served in that roll since 2010. He earned his Bachelor’s Degree in Accounting and Business/Management at Midwestern State University. Matt Shahan has served as the CEO of West River Health Services in Hettinger, ND since 2016. He has a Bachelor’s degree in Information Systems from the University of Montana, and his MBA with a concentration in Healthcare from the University of Mary. Rolland “Boomer” Bojo is the Vice President Patient Care Services & CNO at Catskill Regional Medical Center. He joined Catskill Regional Medical Center in 2004 and has held several positions including Administrator of Patient Care Services and Emergency Manager, Grant Director, Clinical Director of the Emergency Department and Director of Infection Control. He holds a Bachelor’s degree in Nursing from Binghamton University and earned his Master’s degree in Nursing from Norwich University. 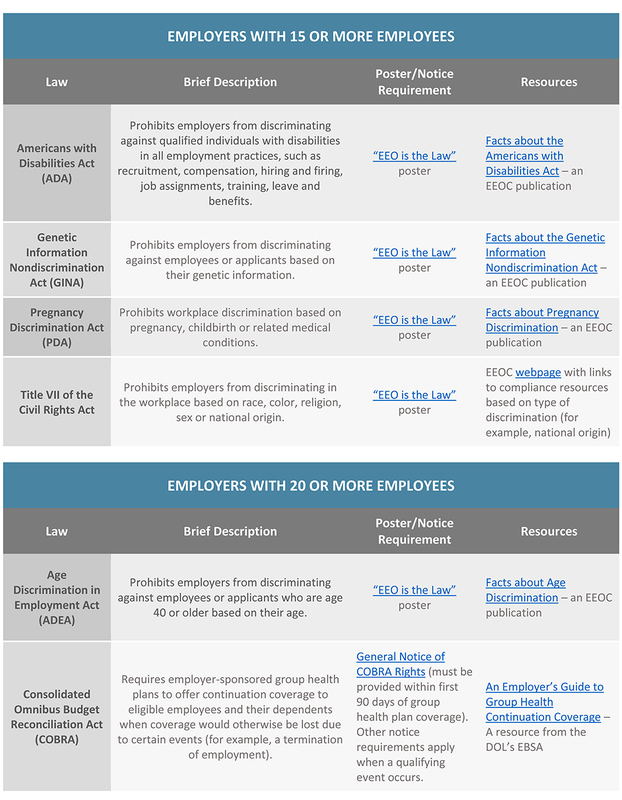 An employer’s size, or number of employees, is a key factor in determining which federal labor laws the employer must comply with. Some federal labor laws, such as the Equal Pay Act, apply to all employers, regardless of size. However, other laws, such as the Family and Medical Leave Act, only apply to employers that reach a certain employee count. 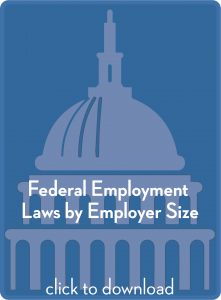 Employers should be aware of the federal labor laws that may apply to their company based on their size. This is especially important for employers that have fluctuating workforce numbers or that are considering hiring additional employees. In general, the more employees that an employer has, the more compliance obligations it will have under federal labor laws. 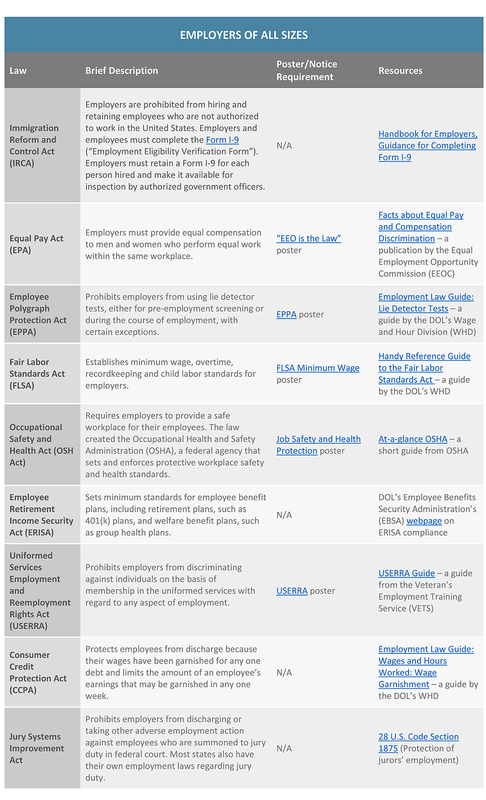 This Compliance Overview provides a guide of key federal labor laws that apply based on employer size. Most states also have their own labor and employment laws. 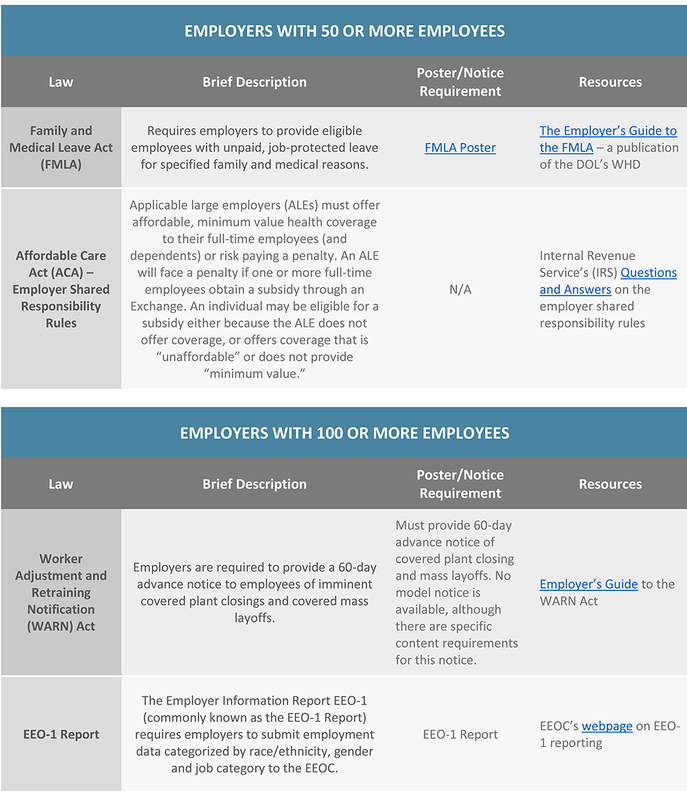 This summary does not address state labor laws, and it also does not address additional compliance requirements for companies that contract with the federal government or businesses in specific industries.